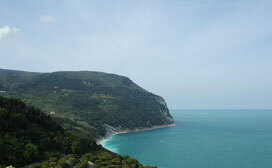 The Riviera del Conero, located to the South of the city of Ancona, is characterized by its natural beauty and by the beautiful old villages, including Portonovo, a beach jewel of the Regional Park of Monte Conero. The park offers interesting itineraries from the point of view of flora and fauna, and inside you can see petroglyphs and stone quarries from Roman times. The Natural Park of Monte San Bartolo features a spectacular cliff overlooking the Adriatic Sea and includes the beautiful villages of Casteldimezzo and Fiorenzuola. An important migration point for many birds species, it is interesting also from the archaeological and historical point of view, as it contains several archaeological finds from the Neolithic era. 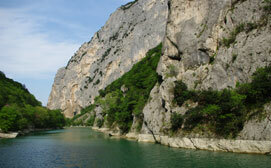 It is located about 50 km from Mondavio. 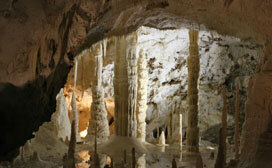 The Frasassi caves are a worldwide known underground landmark. Discovered in 1971 and opened to the public in 1974, they offer a unique and unforgettable experience thanks to the fantastic lighting of the rooms rich in stalactites, stalagmites and underground ponds. 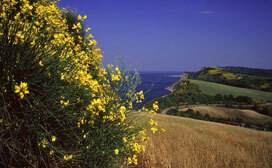 They are part of the Gola della Rossa natural reserve, in the municipality of Genga. The tour is well organized and will leave you breathless. The main room is so big that it can hold the entire Duomo of Milan! Distance from Mondavio: approximately 70 km. An enchanted place, where the river Candigliano winds through the majestic cliffs of the Gorge, a place that offers an amazing wealth of natural beauty with rare and unique flora and fauna. The vegetation consists primarily of oak woods, in a particular habitat that reaches down to the banks of the river.